Juvenile great white shark seen about three miles off the coast of Margate on Sunday, June 26, 2016. According to CBS 3, Jennifer Schreiber and her family took several friends on a shark fishing trip about three miles off the coast of Margate. When they spotted a school of bait fish, they all dropped their lines. Not long afterward, a young great white appeared at the surface. Since great whites are a protected species, everyone withdrew their lines and took out their phones to take pictures of the animal. Schreiber sent photos to the Massachusetts Shark Research Program for confirmation of the species. 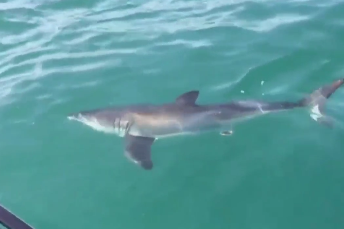 Experts said that the shark's marking was the first of its kind recorded in their database. Given the honor of naming the animal, the crew settled on Carlos. Thousands of great whites are believed to live off the East Coast and experts said juveniles are often found close to the shore. Sharks the size of Carlos primarily eat fish and pose no threat to swimmers, said a spokesman from the Massachusetts Shark Research Program. In May, the famous Mary Lee — a 16-foot, 3,456-pound great white — was tracked heading back to the Jersey Shore, where her annual visits are monitored by nonprofit shark research organization OCEARCH. Last summer, a teen fishing at the beach in Wildwood unexpectedly reeled in a baby shark. Despite a string of highly publicized shark attacks in 2015 — topped by Australian surfer Mick Fanning fighting one off — researchers at Stanford University and the Lenfest Ocean Center say attacks have actually been way down over the last six decades. In recent years, the United States has recorded between 30 and 40 annual shark attacks combined on both coasts.